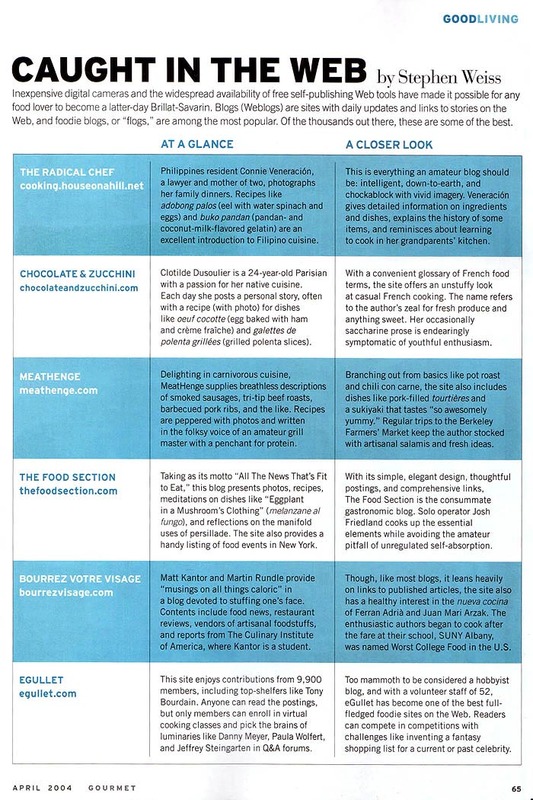 Gourmet magazine calls The Food Section "the consummate gastronomic blog." »Read more about what they're saying about The Food Section. Faux-carb taste test Salon persuades four foodies to open wide for some unappetizing low-carb foods. The Art of The Cure Making guanciale at home: A 45 day journey. A roundtable with four French food bloggers. How many ways can you re-engineer a towel? From the minds behind the somewhat Elmo-esque Grab&Dry dish drying gloves comes the Zip&Dry, which mashes up an apron and a terry cloth dishtowel. Instead of wiping your hands all over your apron, the idea is to use the removable towel, which can be zipped off and washed separately. Available in blue, gray, and green (with contrasting towel) for $39.95 at Just Perfect.